Durian lovers will find the Snow-Skin Musang King Durian Mooncake from Corus Hotel Kuala Lumpur a delight. MOONCAKE and durian lovers will be delighted this Mid-Autumn Festival, as a team of award-winning chefs at Corus Hotel Kuala Lumpur have come up with a new mooncake flavour, the Snow-Skin Musang King Durian Mooncake. 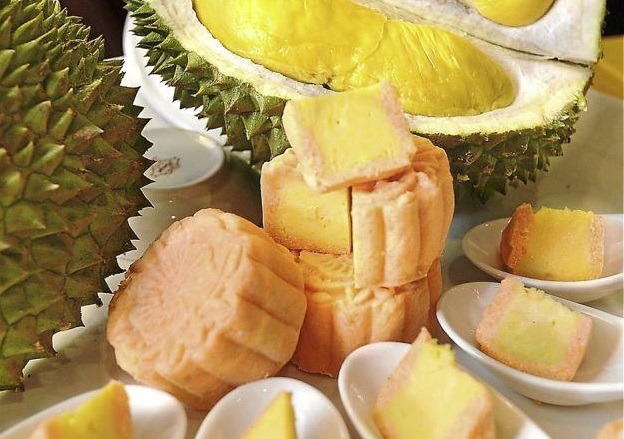 Made using only the finest and sweetest type of Musang King durian fruits, customers can expect a burst of authentic and tantalising flavours when they bite into the pastry. ?The mooncake filling is made using 100% durian pulp with no additional flavourings. ?I think that is what makes our new mooncake flavour different and rich,? said dim sum chef Roland Seow, who created the new flavour through experimentation. ?We make sure that all our ingredients are fresh and of top quality to ensure our mooncakes taste authentic. ?Our durians are selected specially from Raub, Pahang, a place that imports the best durians. ?With its full bodied aroma, smooth, rich and creamy texture, this heavenly delight is sure to be the most sought-after during the Mid-Autumn Festival,? he added. Seow added that all their mooncakes were handmade using wooden moulds to maintain the authenticity of the mooncakes. Returning this year is their award-winning mooncake of 2010 and 2011, as voted by StarMetro, their gold medal Snow-Skin D24 Durian Mooncake. ?It was one of our best-selling mooncakes and since our customers loved it so much, we decided to include it in our menu this year,? added Seow who has more than eight years experience in the field. Apart from mooncakes made from the King of Fruits, the renowned chef and his team have prepared 10 scrumptious and mouth-watering mooncakes such as the luxurious Snow-Skin Green Tea with Red Bean and Walnut mooncake which is also making its debut this year. Made with the highest quality of green tea and walnuts, the mooncake strikes a perfect balance of sweetness with a unique kick of flavour. ?What makes our mooncakes great is the fact that its flavours come naturally from its main ingredients, such as green tea extract and durian fruit flesh,? said Seow. ?Even for our traditional flavoured mooncakes, we use top quality lotus seeds and the freshest assorted nuts to make our mooncakes truly irresistible,? he said. For those who prefer the traditional flavours, there are seven lip-smacking collections of baked mooncakes including the must-have White Lotus Paste and Single Yolk, Assorted Nuts and Seeds and also Red Bean and Melon Seed. Seow personally recommends the White Lotus Paste (Less Sugar), Lotus Paste with Single Yolk and the Golden Jadette and Single Yolk mooncakes. The Golden Jadette is a pandan-flavoured mooncake. ?Our reduced sugar mooncakes are for the health-conscious so they can still enjoy the delicious delicacy without having to feel guilty,? he quipped. 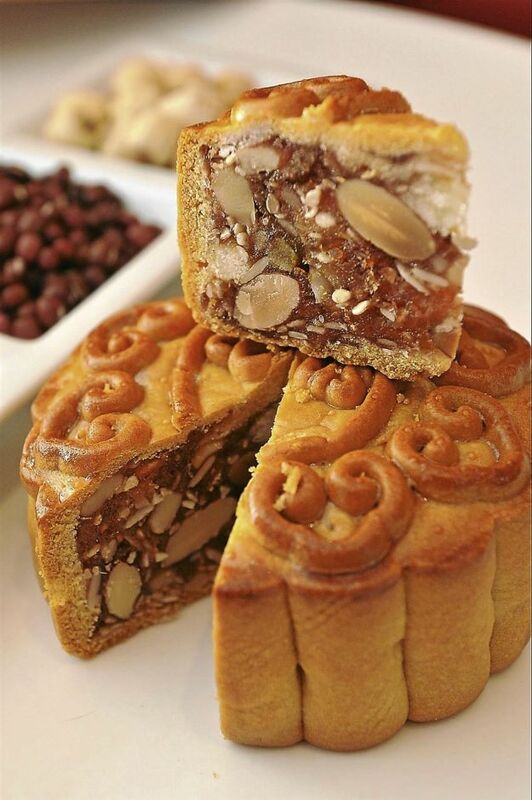 Crunchy delight: The mooncakes with assorted nuts and seeds. mooncake, we have used premium quality walnuts instead of sunflower seeds because of its health and medicinal benefits. ?Walnuts help increase one?s memory and brain power as it is full of vitamins,? explained Seow. Customers can also purchase a set of four mooncakes packed in an exquisite custom-made vibrant red box with intricate and beautiful flower abstract design as gift for their loved ones.